Before you start comparing the features of every Canon digital SLR ever made, ask yourself this: how much are you willing to pay for a camera? Canon digital SLR cameras fall squarely into 4 groups: consumer, semi-professional, professional and über-professional. As you jump to the next level of cameras, the price jumps accordingly. With the jump in price, you also get a lot more features that the pros expect but can be overwhelming to beginners and even intermediate photographers. It makes no sense to pay for a slew of features that you'll never use. With a clear budget in mind (and a sense of your skills as a photographer), you'll substantially limit the number of Canon digital SLR cameras you have to compare. The first Canon digital SLR was the D30, released in 2000. It was a 3.1 megapixel camera that had its quirks but produced fantastic photos. The biggest issue with the D30 was its low megapixel count, which meant that print sizes were limited. Canon addressed this with the D60. This Canon digital SLR was very similar to the D30, but it featured 6.3 megapixels for larger prints. These cameras could capture high-quality images but wow were they expensive. These first-generation Canon digital SLR cameras cost between $2,000 to $3,000 for the camera body only. The technology was so new and advanced that you just couldn't find one for anything less than that. Enter the Canon digital Rebel.The Canon EOS Digital Rebel (also called the 300D) was the first digital SLR camera to be offered for less than $1,000. Canon used the same body style as their popular line of Rebel film cameras, and gave it a digital interior. It was a huge breakthrough, and made the digital SLR accessible to many more photographers. There's no denying it: Canon's digital SLR cameras are immensely popular. 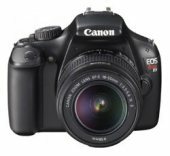 Canon is a definite leader when it comes to the digital SLR camera market, and each new model they release always generates a lot of buzz in the professional reviews and user forums. Canon's dominance in the digital SLR market started with the EOS Digital Rebel, and Canon continues to upgrade their line of digital Rebel cameras. Today, the Rebel legacy includes the Rebel XT (350D), Rebel xTi (400D), Rebel XSi (450D), Rebel T1i (500D), Rebel T2i (550D), Rebel T3i (600D), Rebel T4i (650D), Rebel T5i (700D), Rebel XS (1000D), the Rebel T3 (1100D) and the Rebel SL1 (100D). QUICK OVERVIEW: 18 megapixels, touch-screen LCD, flexible LCD and a wide ISO range. 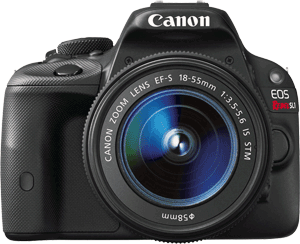 The second Canon Rebel to feature a touch-sensitive LCD screen, the T5i is remarkably unchanged from the T4i. The camera does feature some minor cosmetic improvements, but in the end it is really a T4i with a new number. New camera buyers certainly can consider the T5i, but there is little reason for existing Canon SLR owners to upgrade, especially if they weren't already tempted by the features on the T4i. QUICK OVERVIEW: 18 megapixels, small and light, 3 inch fixed LCD screen. The claim to fame for the Canon 100D SL1 is that it's the smallest and lightest DSLR you can get your hands on. Weighing in at under a pound (407 g) without a lens, the SL1 aims to be the SLR that you CAN carry with you at all times. The SL1 is available with a new 18-55mm EF-S IS STM lens, where the STM refers to the near-silent focusing motor inside the lens. If you're looking for a touch-screen LCD, it's not on this camera. Instead, seek out the Canon 700D T5i or the 650D T4i instead. QUICK OVERVIEW: Full frame, 20 megapixels, built-in Wi-Fi, GPS, huge ISO range, Full HD 1080p video. The full frame sensor inside the Canon 6D allows it to have a huge ISO range: from 50 all the way up to 102400. The camera can minimize noise even at high ISO values, which allows photographers to shoot in very low-light conditions. In addition, the 11-point autofocus is capable of locking onto subjects even when available light is dim. 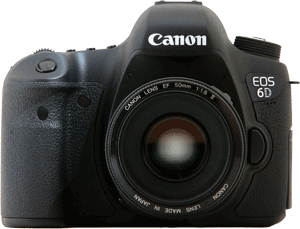 The 6D can capture professional-looking video in addition to high-quality stills. Built-in wireless allows you to connect the 6D to a smartphone or tablet, and built-in GPS captures location information for every photo you take. The Rebel T4i 650D improves upon its predecessors in two very notable ways: this is the first Canon Rebel with a touch-screen LCD, allowing you to set autofocus points, take pictures and change camera settings with the tap (or swipe) of a finger. Second, the T4i has improved autofocus in movie mode - with other digital Rebels, it's actually easier to use manual focus when shooting video. The T4i retains the flexible LCD screen introduced with the Canon Rebel 600D T3i. QUICK OVERVIEW: 12.2 megapixels, dust control, live view LCD, basic HD movie mode. QUICK OVERVIEW: 18 megapixels, flexible LCD, HD movie mode and creative filters. The sequel to the Rebel T2i 550D adds on Canon's new favorite feature: a 3 inch LCD screen that flips out from the camera body and rotates. The T3i also has creative filters that can be applied to any image you take, a new Basic+ mode to take better shots in full AUTO mode and the ability to capture images in different aspect ratios (including 3:2, 4:3, 16:9 and 1:1). And yes, it's still got the HD video mode (now with manual exposure and audio level control) available on the previous Canon Rebel. QUICK OVERVIEW: 18 megapixels, Full HD 1080p video, flexible LCD screen, wide ISO range. 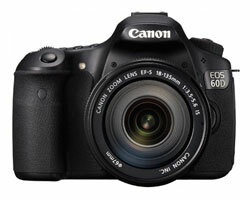 The Canon EOS 60D really is a do-it-all sort of a camera. Action photographers will take advantage of the 5.3 photo-per-second speed and 9-point autofocus while portrait photographers can leverage the live view mode to maintain eye contact with their subjects. Photographers of all types will get to use Canon's first flexible LCD screen on a DSLR: the 3-inch screen flips out from the camera body and rotates in all directions. This flexible LCD can all be used to capture Full High Definition 1080p movies — hard-core videographers can add an optional external microphone for improved audio quality. The technology of today would not be possible without all the development and research that has come before. The cameras listed below can no longer be purchased new, but that doesn't mean that they aren't great cameras - they are just the elderly grandparents of the cameras above. If you decide that there are some modern features that you could do without, then see if you can grab one of these older cameras form someone upgrading to the latest and greatest. Oct. 2005 The key feature of the Canon 5D is that it is a full-frame digital SLR, which means that this camera has no crop factor. 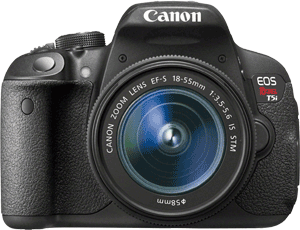 This Canon digital SLR captures the same field of view as a similar Canon film SLR camera. Oct. 2006 The Rebel xTi includes a 10 megapixel sensor and a dust control system. The intuitive control layout on this camera make it very easy to use and it takes very high-quality photos when paired with the right lens. The xTi was one of the least expensive10 megapixel digital SLRs. Sept. 2007 The Canon 40D can take 6.5 photos per second up to a maximum of 75 JPG images or 17 RAW. In addition to this blazing fast speed, the camera includes a completely updated 9-point autofocus, a fast image processor (to transfer photos to the memory card), Canon's dust control, and the addition of a live view mode on the camera's large 3 inch LCD screen. With a rugged frame and weather-resistant seals and gaskets, the 40D is designed for aggressive use. April 2008 The Rebel XSi is the first Canon digital SLR to make the switch from Compact Flash cards to the smaller and lighter SD memory cards. The standard kit lens offered with the Rebel XSi is the EF-S 18-55mm f/3.5-5.6 Image Stabilized lens. This means that the XSi has the three top digital SLR features: dust control, live view and image stabilization. May 2008 The Rebel T1i follows a trend that began late in 2008 - digital SLRs with video. The 15.1 megapixel sensor can capture High Definition (HD) video that can be played on a widescreen TV via HDMI. The T1i also steals some features from the more advanced 50D, including face detection autofocus, Canon's Auto Lighting Optimizer and the "Creative Auto" mode. Aug. 2008 The Rebel XS is Canon's simple alternative to all the feature-packed cameras available. Designed for photographers making the transition from point-and-shoot to digital SLR, the basic feature set on the XS lets you take great-looking pictures, without a lot of additional frills. The basic feature set kept the price of the camera low, making the XS one of the least expensive digital SLRs available. Oct. 2008 The Canon EOS 50D is a digital SLR priced with amateurs in mind and packed with enough features satisfy the needs of professional photographers. The main enhancements over the 40D come in the form of a faster image processor (DIGIC 4), a wider ISO range (100 to 12800), an LCD with 4x more pixels than the 40D (for enhanced color and clarity) and a face-detection autofocus option. If you'd like to share your images at home, the 50D has an HDMI port that allows you to connect the camera to a flat screen TV.